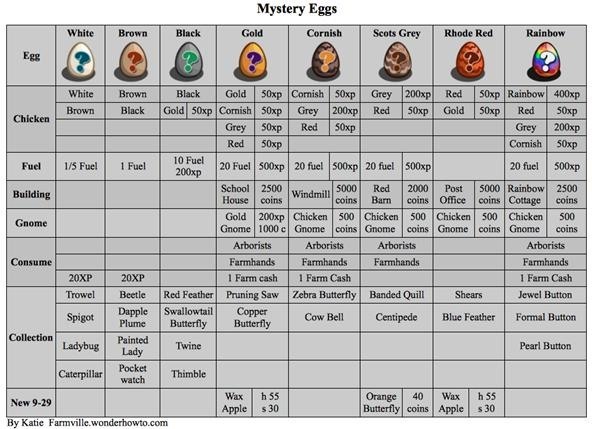 I've created this chart which shows you all the contents of each Mystery Egg that you can find in the FarmVille game. Rainbow > Cornish > Scotts > Red > Gold/ Super > Black > Brown > White. Remember to send this post to your friends if you continue to find the lower level eggs from coops while visiting neighbors. You can use it to help explain to them why certain eggs are more preferable! 3 neighbors can collect a Mystery Egg posted on the Facebook feed. The coin value next to the name of each item is it's sell value. The XP listed next to each item is how many Experience Points will be added to your bar when you open that egg. Letting Chickens run all over your farm and storing them in huge numbers is not recommended. It really slows down the game and Chickens only harvest for a maximum of 64 coins. Collect Calves instead! Here's why. Save your space for crop mastery and pretty decorations. Learn about rainbow chickens here, they are awesome! I tried this chicken coop stuffing 5 times, and it did not work for me!